Flipkart-owned mobile payments company, PhonePe has been a sensation ever since its application launch back in August 2016. The service quickly crossed 50,000 user mark in just one month after its inception and recently, the company on their official Twitter handle revealed that they had passed five million downloads in Google Play Store, which is an achievement. What makes the application so unique from others is the fact it uses the all new Unified Payment Interface (UPI) with which every user can send money directly to the receiver’s bank account. Wondering how? Well, that’s the concept of this application. 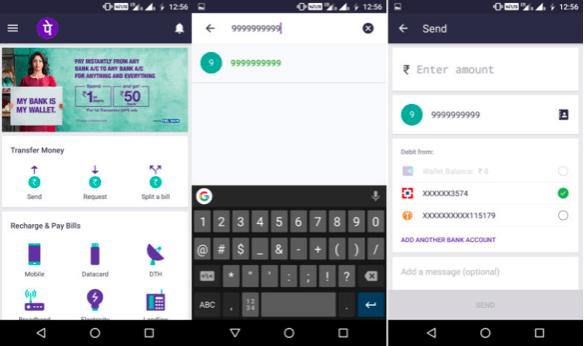 PhonePe makes use of the receiver’s phone number to transfer funds, and that’s not the only feature it offers. 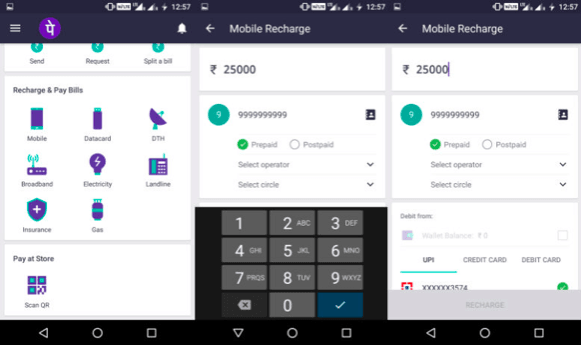 Take a look at all the features of the PhonePe application and how it differs (USP) from other digital wallets apps such as Paytm, FreeCharge, etc. One of the major advantages with PhonePe is that it allows you to set a four-digit MPIN to make all your transactions, just like an ATM Pin. The highlight here is, you need to enter the MPIN every time to make payments, which is a great security feature to have around. Another USP of this product is, you can transfer funds to anyone with the help of just their mobile number. 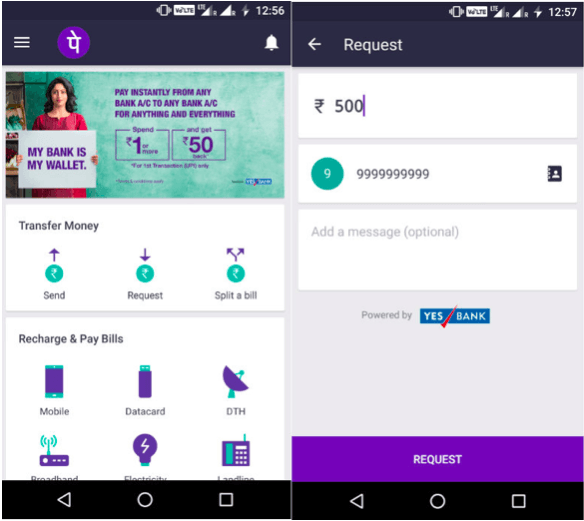 All you need to do is enter the receiver’s mobile number in the send money section and select your bank account or PhonePe wallet to transfer the funds at zero percent charge to their bank account. As said earlier, PhonePe uses UPI payment system, and that works on IMPS. With this way, the fund transfers will be done within seconds, same as the case with IMPS. PhonePe offers every feature which is provided by any other digital wallet app such as Paytm, FreeCharge, Mobikwik, etc. However, it has new tricks under its sleeve. Let’s check out all the features offered by PhonePe. 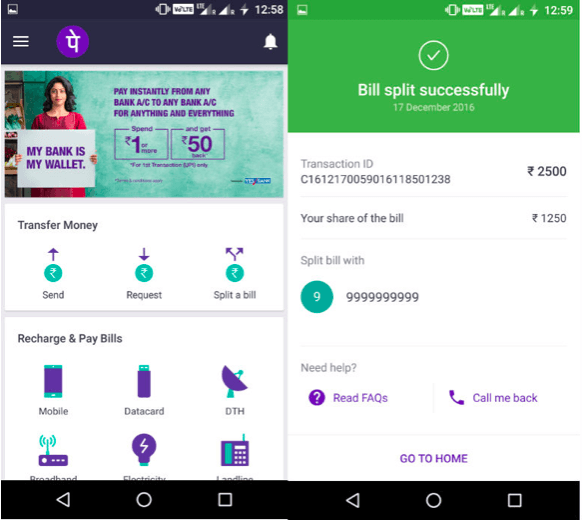 With PhonePe, users can send money to all their contacts anywhere and at any time. Suppose, if you want to send some amount to your friend, then he should be registered in PhonePe, and if you have balance in your PhonePe wallet, the amount will be deducted from your wallet balance. Otherwise, the amount will be deducted directly from your respective bank account. Another feature which works flawlessly is the ‘Request Money.’ If you require some amount from your friend or family member, then the person will be notified with an SMS message, which is a good thing and payment will be sent as well to pay the requested person with just one click instantly. PhonePe even allows its users to restore with prepaid and postpaid mobile numbers. Not only mobile numbers, but users can also recharge their landline, data card, and can also pay their electricity and gas bills. Users can easily cut the payment bills with their contacts, and they will be notified with an SMS along with the bill amount. Being a Flipkart venture, PhonePe allows you to pay in Flipkart at the payment. The process is very simple, just select the PhonePe wallet at the time of checkout and log in with your credentials. As of now, you can only pay in Flipkart, but the company is adding several other partners as well to make it easy for customers. The next ones to join the list of payment supported merchants will be Myntra and Jabong. 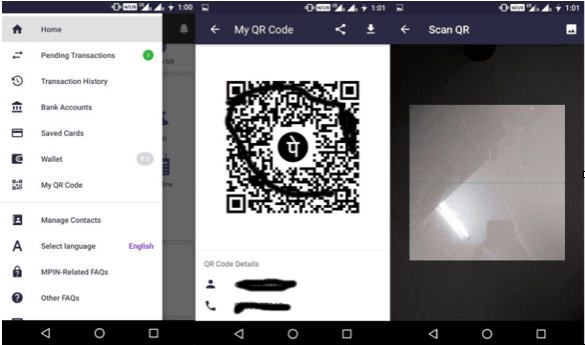 As seen on other digital wallet services, PhonePe also allows you to pay merchants via a dedicated bar code and vice versa. As stated earlier, PhonePe uses the IMPS money transfer mechanism to transfer your funds. As per RBI, with the IMPS service, users can send up to two lakhs per day, whereas in the PhonePe, users are limited to one lakh per day, which is a great thing as other digital wallet services offer one lakh per month. That being said, the transaction limits are higher on PhonePe (30 lakhs per months) when compared to other digital wallet services, which is limited to Rs. 20,000 per month. Another advantage with PhonePe is that the money that you sent – will be deducted from your linked bank account directly, whereas, in other wallet apps, you have to load the money first to your wallet and then transfer them to others, which is time consuming. One of the biggest advantages is that PhonePe allows you to transfer money to your bank account or other bank accounts at zero transaction charges. As of now, other banks are also offering zero transactional fees, but only up to December 31. They would want you to spend that money on PayTM. Why couldn’t you use that money on PayTM itself? So many recharge/bill payment options are there or even movie ticket booking, etc. By just adding money to PayTM wallet using Credit card & then asking for a refund, you are causing a loss to them. Even i asked them to credit it back to my wallet so that I can use it in shops. That also they are not doing it. Refunds for credit/debit cards take longer. If the transaction has failed or was cancelled, the money will be refunded sooner or later but they should process it first. Won’t recommend Paytm to anybody though. Too mismanaged. So…now you mean that the money was not credited to your PayTM wallet after the transaction? In that case PayTM is not at fault. If PayTM had received the money, it would have certainly been credited to your wallet. But if the transaction ended in a server error after the amount being debited to your card, then the Bank will return the amount to the same card. In case of Debit Cards, it generally takes 3 to 5 working days. In case of Credit Cards, possibly it will take a bit longer.